Messi and Suarez as good as ever? First, with 85 minutes gone, the Uruguayan striker curled a fizzing low strike into the bottom right corner from 20 yards. And then, not to be outdone, Messi immediately added the second with a superb solo strike which culminated with a mesmerisingly calm finish. 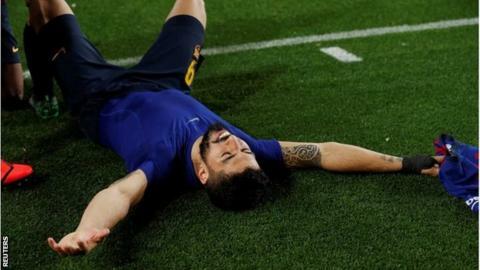 The bad news for Manchester United is that Suarez and Messi have both been producing those heroics on a regular basis - in fact, they had done so just four days earlier, rescuing a point at Villarreal with a pair of late strikes as Messi crashed home a free-kick and Suarez netted a spectacular volley. Between them, they have scored 14 goals in the last six games (10 for Messi, four for Suarez), with Messi taking his tally for the season to 43 goals in 40 games (he also has 17 assists). Many observers believe this could so far be Messi's best season yet, and the only real justification for thinking he might be 'in decline' is if you haven't actually watched him play. Messi and Suarez work brilliantly together, but they are by no means Barca's only threat: Messi's other favourite partner in crime is full-back Jordi Alba, a master of making well-timed darts into the box onto Messi's precise throughballs. The big question is who will join them in attack. Saturday's starter was former Liverpool man Philippe Coutinho, who became a victim of one of Oblak's great saves. But Coutinho has struggled for much of the season and would certainly be replaced by Ousmane Dembele if the rapid Frenchman was fit - which he might just be on Wednesday night. Another option open to Valverde is fielding a 4-4-2 formation with the midfield bolstered by veteran Chilean warhorse Arturo Vidal, who was suspended for Saturday's meeting with Atletico but has often been selected for big games this season. Regardless of which shape Valverde chooses, he can count upon a solid spine thanks to the presence of Marc-Andre ter Stegen in goal, Gerard Pique in the centre of defence, and Arthur in midfield. Ter Stegen didn't have much chance to prove his credentials on Saturday as Atletico's threat was limited to a pair of easily saved efforts from Antoine Griezmann, but the German is a fine shot-stopper who also serves as the first line of attack with his excellent distribution skills. In front of him, Pique has recovered from a slow start to the season to produce a series of majestic displays over the last couple of months - his importance was underlined when he was rested from Tuesday's trip to Villarreal and the defence immediately looked all at sea, conceding four goals against a relegation-threatened side. The revelation for Barca this season, and a player who will be unfamiliar to many United fans, is Brazilian midfielder Arthur, a central midfielder snapped up from Gremio in the summer. In another way, however, Arthur will look extremely familiar even if you've never seen him before, because his playing style bears a striking resemblance to old master Xavi. Although it's a stretch to compare anyone with such an icon, Arthur very much performs the same function in the team and racks up similar statistics - in a trip to Valencia earlier this season, the 22-year-old recorded the highest number of passes in a La Liga away game (135) since - you guessed it! - Xavi in 2012. Is there any hope for Manchester United? Despite their success on the domestic front, however, the Champions League is Barca's chief target. They have been hugely frustrated to suffer three consecutive quarter-finals exits in the last three seasons, especially when they were then forced to watch Real Madrid lift the trophy on each occasion, and Messi stridently asserted in a pre-season speech to fans: "We promise we will do all we can to bring that beautiful trophy back to the Camp Nou." But Manchester United should not lose all hope, because they are certainly not unbeatable. The Catalan side's biggest weakness is a defensive vulnerability against rapid counter-attacks, which was particularly evident in Wednesday's stunning 4-4 draw at relegation-threatened Villarreal when the hosts regularly flooded forward to exploit huge open spaces - in exactly the same way as Betis during their victory at the Camp Nou in November. Busquets is a particular concern in this respect, with the veteran midfielder losing the little pace he had and often struggling to contain more physically-imposing opponents. However, the defensive shambles at Villarreal was an anomaly due to the absence of two key players who were being rested: defensive organiser Pique and Rakitic, who does more than anyone to support Busquets. Another potential problem for Barcelona is their physical condition, after being subjected to a tough game against energy-sapping Atletico on Saturday while United enjoyed a free weekend to put their feet up - except manager Ole Gunnar Solskjaer, who travelled to the Camp Nou to watch the game against Atletico from the VIP seats (along with, strangely, Indian cricket legend Rahul Dravid). Barca could also be afflicted by some mental gremlins after a series of poor results away from home in the Champions League. Following the 0-0 draw at Lyon in the last 16, Barca have not won an away knockout tie since beating Arsenal 2-0 in February 2016 - a six-game winless run which has included heavy losses at Atletico (2-0), Paris St Germain (4-0), Juventus (3-0) and Roma (3-0). So there are reasons for United to believe they can find a way past Messi-inspired Barca, but it will surely be anything but easy.